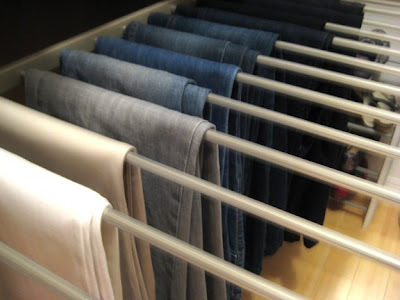 I am sure you have all heard the analogy between weight loss and closet purging. I believe it! I also honestly believe that if we get our lives (and closets) in order, we will feel emotionally and mentally better. Well, I do, at least. And I noticed my body image changed as soon as I had that first cathartic closet-cleaning experience after Finn was born 2 years ago. I went over to the Home & Decorating section of Martha Stewart's website (don't browese too long on that site, unless you want to fall victim to an inferiority complex...not that I love Martha, but I can't deny she has a gift). Check out THIS LINK to find "Simple Ways to Stay Tidy" and a "Share Your Ideas" forum. She has a lot of great tips overall, like Clotheskeeping, Organization Tip of the Day, and a Quiz to see just where you stand in the organization department. 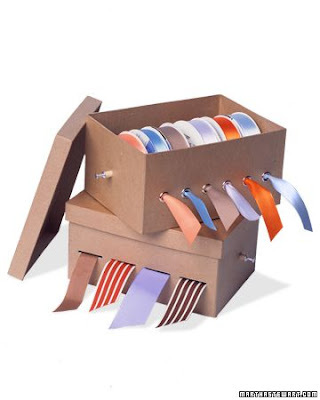 I found this quick tip for ribbons. I love that it looks simple to create (especially the bottom box), and it's homemade! I am so jealous of your closet! That is one of my next Home renovations…some kind of closet system. Mike and I each have one sliding door closet (you know the one with one shelf and bar at the top of the closet?) Lame-O. Nice camera too! I LOVE your closet! Organization is such a great feeling. Yay for you! All I can say is W-O-W. 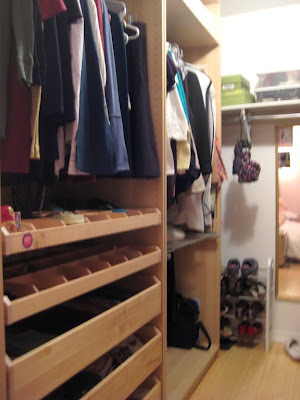 I ♥ that closet organizer! How exciting! You've got a fantastic closet! Kudos to you for knocking out the project in a day. 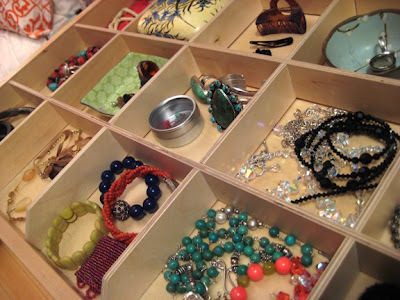 I want a place to store my jewelry like you have. That is sooo lovely! And, that way you can see everything you have! And I, too, am not a complete fan of Martha...I am of her staff! But talk about feelings of inferiority....sometimes just going on etsy gets me all feeling so small and insecure...which really isn't my personality, but it makes me wish I could do more and be more crafty. Same with some scrapbooking sites and even blogs. But I do love being inspired by each of them and Martha's stuff really does inspire me too!